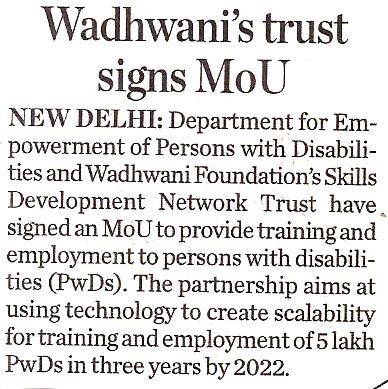 Department for Empowerment of Persons with Disabilities (DEPwD) and Wadhwani Foundation’s Skills Development Network Trust has entered into a partnership to provide training and employment to persons with disabilities. The strategic partnership between the two aims at using technology to create scalability for training and employment of 500,000 persons with disabilities (PwDs) in three years, of 25 lakh by 2022. To achieve this ambitious goal, Skills Development Network Trust has committed to co-invest some Rs 12 crore to Rs 60 crore over the next four years, by leveraging the government funding in the ratio of 1:10, a Wadhwani Foundation release stated. Key focus areas of this collaboration will include program management and support for training and employment of 500,000 persons with disabilities (PwDs) over three-years through government’s National Action Plan for Skill Training of Persons with Disabilities, creation of IT-enabled interactive content for PwD training to meet the scale requirement and assisting public companies to meet their requirement of hiring PwD’s for 3 per cent of their staff. Under this MoU. Wadhwani Foundation will also set up Wadhwani Chair at one or two national institutes for PwD to provide research and technology expertise. Elaborating further, Department for Empowerment of Persons with Disabilities (DEPwD) joint secretary Mukesh Jain said, India needs to integrate its sizable disabled population into society. This can only happen if we empower PwDs economically and the best way to do so is to train them for a job. Through this MoU, Wadhwani Foundation’s SDN trust will help the government bring in multi-dimensional technology enabled e-content solutions like massive open online courses to meet PwD related skilling objectives. Incidentally, Wadhwani Foundation has been at the forefront of supporting training and placement of disabled individuals into mid-skill entry level jobs. One of its initiative christened Opportunity Network for Disabled enables educated PwD youth to get regular job openings in mainstream organizations.